Step 1~Reserve the bathroom or any other room with a tub and running water. A large wash tub and a water hose in the back yard will work fine. Step 2~Set up a work table near the tub. Step 3~Close the bathroom sink's drain. Step 4~Find two bath towels in good condition. Avoid using worn towels with holes or tears in them. Step 5~Fold one towel twice or more so it will form a thick pad to protect the valves and delicate tubes of the instrument. Step 6~Place the towel on the bottom of the bathtub. Be sure it covers the drain hole. Step 7~Fold and place the other towel on the tabletop or the plywood covering the sink. The work area must be clean and supply cushioning. Step 8~Find a comfortable chair or stool. Step 9~Make sure that the light sources are adequate. Step 11~Fill the tub with 6 inches of lukewarm water and add a 1/2 cup of mild liquid soap. Step 1~Gently remove the mouthpiece with a slight twisting motion of the hand (no pliers allowed) to the left. Step 2~Place the mouthpiece on the work area towel. 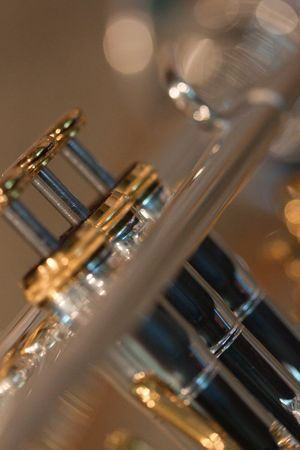 Step 3~Apply a slight bit of pressure on the main tuning slide (where the spit valve is located) by hooking the right thumb on the inside curve of the slide and placing the remaining four fingers around the outside end of the trumpet bell. Step 4~If the slide is stuck, put three drops of penetrating oil on the two points where the small slide enters the larger. Step 5~Try removal again after 15 to 30 minutes. Step 6~Remove the tuning slides for the first, second and third valves in the manner described above. Step 7~Apply penetrating oil to the screw-off hubs at the base and top of the three piston valves. Step 8~Gently unscrew these six hubs. Step 9~Carefully unscrew the three finger-pearls at the top of each piston. Step 10~Place the three finger-pearls and six hubs on the work area towel. Step 11~Slowly withdraw the three pistons out of their casements. Place them on the towel. Step 12~Determine the location of the three valve springs. Step 13~Handle the pistons so the top felt or cork cushions remain intact with any hardware sleeves. 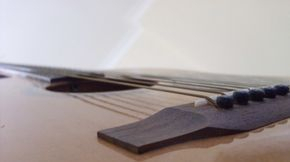 Tired of changing guitar strings? We can do it for only $15. plus the price of strings. Need a tennon cork replaced or gooseneck. Make an apointment and we can get it done. Please do not try to remove it yourself. Bring it to us and we'll do it fast....and free!